CHICAGO–Sick newborns often rely on a ventilator to supply oxygen and are tethered to the life-saving device by a plastic endotracheal tube (ETT). The American Academy of Pediatrics has counseled health care providers that ordering a chest X-ray daily simply to verify positioning of the ETT ratchets up costs without improving patient safety. A quality-improvement initiative by Children's National Health System's neonatal intensive care unit (NICU) finds that these chest X-rays can be performed just twice weekly, lessening the chances of a breathing tube popping out accidentally, reducing infants' exposure to radiation and saving an estimated $1.6 million per year. "The new Children's National protocol reduced the rate of chest X-rays per patient day without increasing the rate of unintended extubations," says Michelande Ridoré, M.S., program lead in Children's division of neonatology, who presented the research during the 2017 American Academy of Pediatrics (AAP) national conference. "That not only helps to improve patient safety–for newborns who are admitted to the NICU for longer periods, there is the additional benefit of providing significant savings to the health care system." Children's NICU staff assessed how many chest X-rays were being performed per patient day before and after the protocol change, which applied to all intubated newborns in the NICU whose health condition was stable. Newborns had been undergoing a median of 0.45 chest X-rays per patient day. After the quality improvement project, that figure dropped to 0.23 chest X-rays per patient day. When the project started in July 2015, the NICU's monthly X-ray expenditure was $289,520. By the end of 2015, that monthly X-ray spend had fallen to $159,424–resulting in nearly $1.6 million in annual savings. The more restrictive strategy for ordering chest X-rays was a core component of a broader quality improvement effort aimed at lowering the number of unplanned extubations, which represent the fourth most common complication experienced by newborns in the nation's NICUs. "When you reduce the frequency of patients in the unit being moved, you decrease the chances of the breathing tube coming out accidentally," Ridoré says. 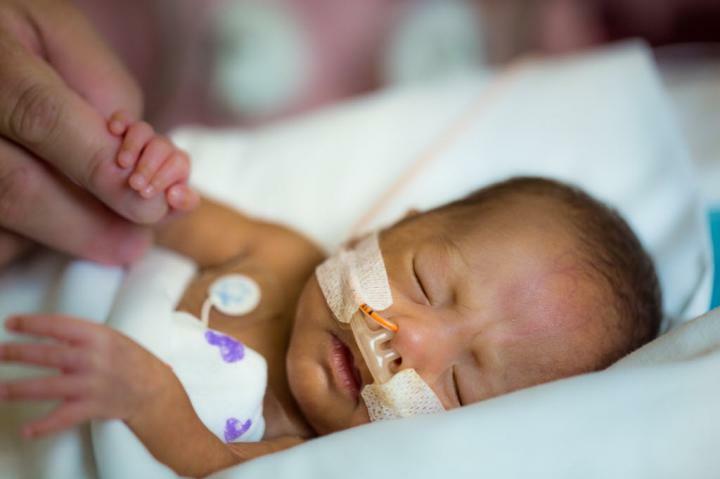 "By reducing unplanned extubations in the NICU, we can improve overall clinical outcomes, reduce length of stay, lower costs and improve patient satisfaction." When a breathing tube is accidentally dislodged, newborns can experience hypoxia (oxygen deficiency), abnormally high carbon dioxide levels in the blood, trauma to their airway, intraventricular hemorrhage (bleeding into the fluid-filled areas of the brain) and code events, among other adverse outcomes. What's more, a patient with an unintended extubation can experience a nearly doubled hospital stay compared with the length of stay for newborns whose breathing tubes remain in their proper places. Each unplanned extubation can increase the cost of care by $36,000 per patient per admission. To tackle this problem, Children's National created the Stop Unintended Extubations "SUN" team. The team created a package of interventions for high-risk patients. Within one month, unintended extubations dropped from 1.18 events per 100 ventilator days to 0.59 events during the same time frame. And, within five months, that plummeted even further to 0.41 events per 100 ventilator days. "Unintended extubation rates at Children's National are lower than the median reported on various quality indices, but we know we can do more to enhance patient safety," Ridoré says. "Our SUN team will continue to address key drivers of this quality measure with the aim of consistently maintaining this rate at no more than 0.3 events per 100 ventilator days." Michelande Ridoré, M.S. ; William Pastor, M.S., M.P.H. ; Dorothy Bulas, M.D. ; Sarah McKenney; Lamia Soghier, M.D. ; and Billie Short, M.D. Michelande Ridoré, M.S. ; Jessica Carman, R.N. ; Lisa Zell, B.S.N. ; Ann-Marie Brown, R.N. ; Carmen Blake, B.S.N. ; Cheyenne Gayle, RRT-NPS; Billie Short, M.D. ; and Lamia Soghier, M.D.